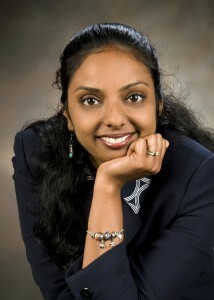 Subhashini Ganapathy, Ph.D., is all about the human-computer connection. Her research has been a driving force in the transformation of the field of human factors engineering. An assistant professor in the Department of Biomedical, Industrial, and Human Factors Engineering, Ganapathy has established high-quality multidisciplinary, independent research in the area of human-computer interaction that has garnered more $350,000 in external funding. She directs the Interactions, Design and Modeling Laboratory. She also has a secondary faculty appointment in the Department of Surgery. Ganapathy is an expert in bridging the gap between academic research and industry needs by understanding technology landscape. Her breadth of research in human factors in mobile communications technology, ranging from collaborations with VA hospitals to the use of mobile technology in engineering education, places her at the forefront in the College of Engineering and Computer Science. “Dr. Ganapathy is already becoming a leader in teaching, research, and service, despite just over two years in her faculty appointment,” said Nathan Klingbeil, dean of the College of Engineering and Computer Science. In the classroom, Ganapathy has incorporated many creative techniques for teaching concepts related to human factors engineering. She has also introduced two new courses relevant to current research needs: Human Factors in Mobile Computing and Computational Neuroergonomics and Health Care Applications. With these and other courses, Ganapathy tirelessly tries to prepare the next generation of students in fostering strategic thinking and applying new methods towards human-computer interaction. She wants to drive innovation and transform education by making it more accessible to students. Ganapathy is also a prolific scholar, producing more 40 papers for peer-reviewed journals, book chapters, and conferences and has three filed patents in the area of mobile augmented reality.